Second chance repost #6. Black Belt Path To Life. – My thoughts on a page. Todays second chance repost comes from the blog The Chatter Blog. An inspiring post definitely worthy of a second chance. 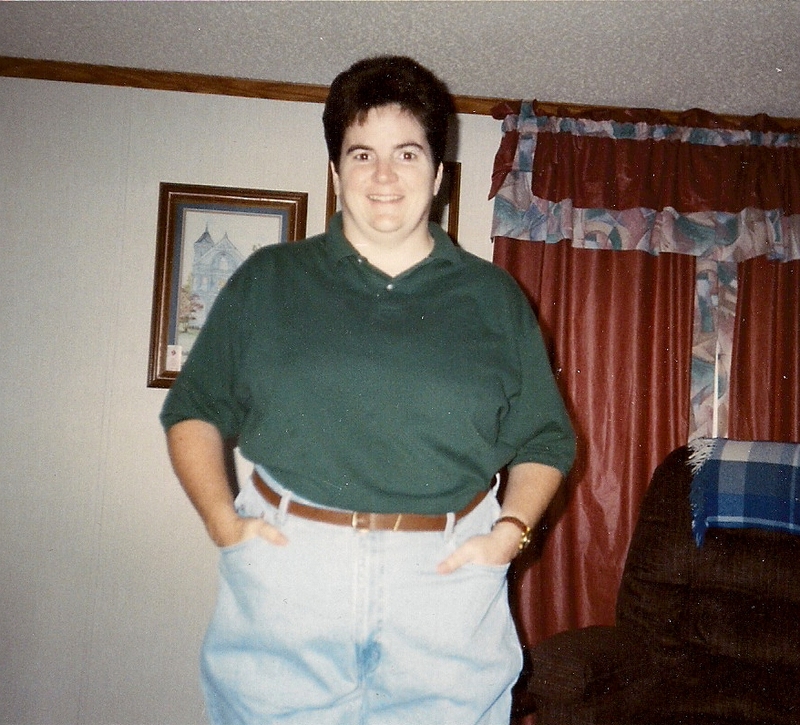 When I was 31 I weighed in at a good 220 pounds. I was “content” with life. But didn’t have any real aspirations. Nothing defined anyway. I knew I didn’t want to be fat. And I knew I didn’t have any goals. I had a college degree and a decent job. I had family and goodness around me. But I wasn’t really doing anything with myself. I wasn’t writing regularly. I wasn’t involved in church. I was somewhat involved in community but then again…not really. Then my ten year old daughter was involved in what turned out to be a life altering incident for me. To summarize; she tried out for a cheer leading squad. She spent a week going to the camp. Practicing at home. Being in love with the idea of cheering and belonging to a group of girls. It was through her school. She did not make the squad. But the demoralizing part was the way she didn’t make the team. The “big girl” cheer leaders from high school were part of the cheer leading camp. At the end of the camp they gathered the large crowd of little girls in the gym. Parents gathered behind. Each big girl had a flower. Each big girl presented her flower to one of the little girls chosen to be on the team. You would think that was a sweet method to welcome those little girls. Okay, one mom, me, did think that. For about two minutes until they all finished. The “leader” who was an adult coach said to the rest of the girls “that’s all”. I was stunned. No speech before or after saying “great job girls” or “keep practicing” or “there are only so many spots or else you would all have been chosen”. Nothing. There were literally no words of thanks or encouragement for those little girls left sitting on the gym floor. This is where the parents stepped in. Scooped up their kids and left. I was pretty irate. My child cried for what now seems like 2 weeks. And I think it was 2 weeks. So I took matters in to my own hands and told daughter we were going to find something else for her to do. Martial arts. There was only one local class. I signed her up. I took her to every class for a month. I sat my 220 pound body on the floor or the chair if available and watched her for a month. Then it occurred to me that I was there for 4 nights a week. Why not join? I could do this. Surely it would be good for me. Right? I did join. I gained 15 more pounds. But I worked out. And I practiced. And I had direction and goals. I had motivation. My daughter and I worked and worked. For two and a half years we sweat, we strained, we learned. Then I blew out a knee. That’s okay. I got it fixed. Which ended up in a blood clot. Which took me off of my working out feet for about 3 months. But I wrote down my forms and my steps and practiced in my head. Literally. I feared forgetting. Then life changed in a way no one can prepare you for. My dad died. This shocked me. Terribly. Death? His life is over? Just like that? This scared me. This didn’t stop me from proceeding. It encouraged me to go forward. 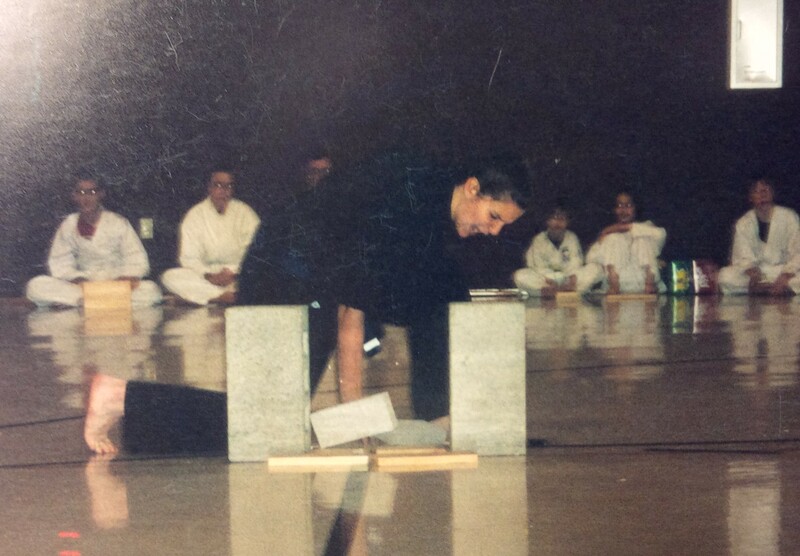 Very shortly after my dad died I was talking to my instructor about testing for black belt. She wanted to speak with me privately so we went to the “office”. We spoke about requirements for the test which was about a year or so away. She asked me what my goal weight was. I told her “one hundred and sixty pounds” I knew because I had always thought I would be healthy at 160. She said “that is one of your requirements”. I said “what?! I’ve never been able to lose weight”. She said “what have you done to try?” I had no answer. She smiled. And I smiled. I had not tried. I spent the next year working out, but even better than that, working on me. Who I was. I had always looked in the mirror and saw a vision. I never looked in the mirror and saw me. I learned about me and I started, for the first time in my life, to know me. And I liked me. And I started to notice other things. About other people. And I started to trust people. And I liked other people. I became involved in community. Real community. I made goals. I learned about living. My daughter and I were approaching a goal that many may not have understood. It was not easy. The physical requirements were, in my opinion, harsh. But, also in my opinion, worth it. Until I broke my neck. Okay, I say that for emphasis. But it’s true, in a long story way. I injured myself just months before my daughter and I were going to test jointly for a black belt. We had spent countless hours training. We were doing this. 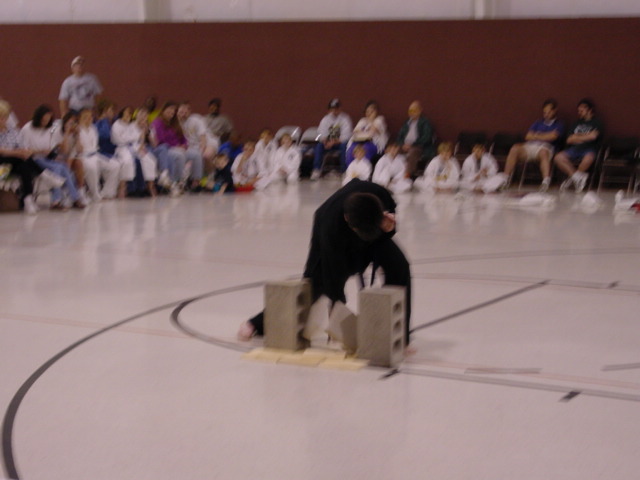 I remembered as a beginner learning what a black belt had to do to test. 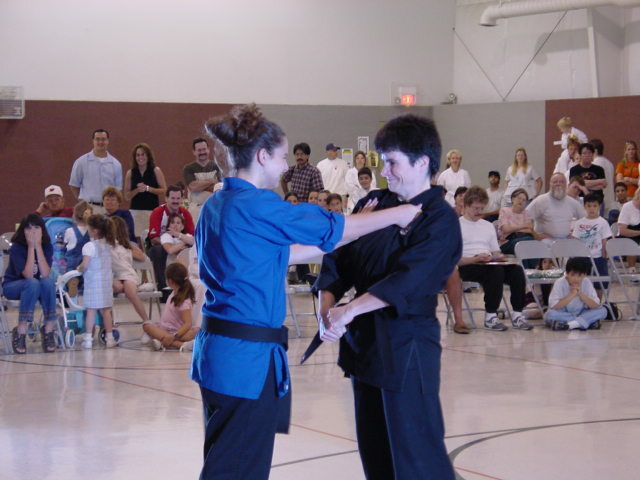 And I very vividly recall saying I would be happy to get to dark blue belt but I would never test for black belt. Yet here I was. 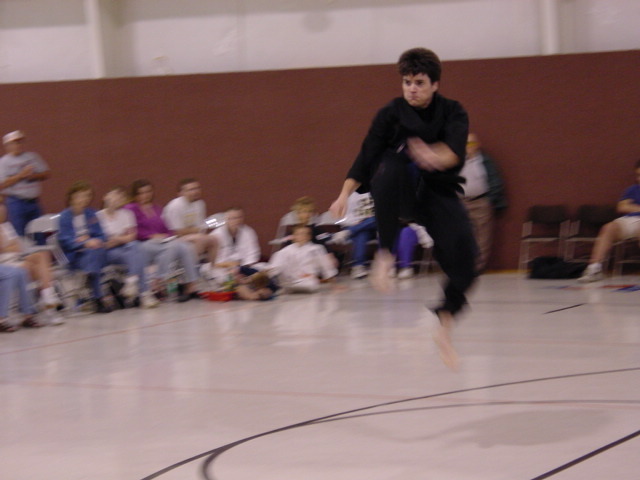 I was going to test for black belt! I was not afraid of the stressful and strict testing guidelines. I was actually doing this. No, no I did not realize that. That’s not how my surgeon explained it to me. But when I asked him on his next rounds, he did confirm this. But he let me ride my exercise bike. Six months later I woke up one May morning. I went to the cemetery and put a dozen carnations on my father’s grave. Each one colored a different color to represent each color belt I had worked through. I went to Columbus. My mother sat in the audience and I gave her a dozen carnations, colored like the one’s I had placed on my father’s grave. I walked on to the floor. I bowed in. I weighed 155 pounds. I was solid. I was strong. I had long ago passed the test that got me to this test. The test. That first test. Was about my life. Opening my eyes and realizing I had to participate. I had to join my own life. I had to wake up every day wanting to accomplish something. Work was not something I did nine to five. Work was what I would have to do to own my life, my self. Work is good. Through work you understand accomplishment, joy, and even peace. Without it you don’t know the meaning of vacation, rest and fun. Without work you do not know reward. In this picture my fifteen year old daughter is “punching me in”. It is a ceremonial process where all black belts of the school welcome you with a “punch” to the heart. In the background is my youngest daughter with her hands over her face, celebrating in the emotional moment for the three of us. It sometimes stuns me that a poorly run cheer leading camp for little girls that I really had nothing to do with is what changed my life. Whoa! Epiphany!!! Maybe it was me that actually changed my life! Or maybe I just decided to live it. **********If you have a post you would like to give a second chance to, just check out the second chance sticky post on my blog, or use the contact me link. Apologies once again. Sorry, Sorry, Sorry. This is a wonderful story of empowerment. You have so much to be proud of! Wonderful determination and perseverance to reach your goals! What an absolutely beautiful and inspiring post. Makes me think maybe I should set some goals for myself. Set some goals and actually be serious. Amazing what things can overcome the inertia and push you to action. wow, way to take back your power, congrats! Wonderful! I don’t know you, but I’m so proud of you! My old Granny always told me that I could do whatever I wanted to do, but I needed to fight, sometimes more than other times. Great post. Oh dear. I did it again.This is not me featuring in this post. It is a repost in my series offering to give bloggers a chance to give an old favourite post a day out again. This is a post by the blogger Colleen who blogs at the Chatter blog. Sorry to have misled you. I have updated it since. Pingback: Apologies once again. Sorry, Sorry, Sorry. | My thoughts on a page. Way to go, CM. Another testimony to your strength. Weight issues can be very trying and relentless. I have a friend whose daughter-in-law gave birth to twins, for the second time, and because she is very obese (over 300 pounds) and unable to move well, the hospital staff reported her to child protective services so now, on top of everything else, she is fighting to get custody her two sets of twins back. Thank you Jackie, it is relentless. I feel bad for your friend. I hope she gets her children back. What a horrible thing to have happen. Wonderful post. Isn’t it amazing what we do when it comes to our kids. I’ve had a few minor moments like yours when I’ve done things for the kids and then thought ‘why can ‘t I do this for myself?’ I’m definitely more determined since I had kids. My husband was into martial arts when he was younger, and I have to say I really love the discipline and self-control it encourages and depends upon. Inspiring and gorgeous! thank you for sharing your story! Those are words I needed to hear. Thanks.